When you think about it we’re built up from billions of smaller common modules with a lot of minor variations, why shouldn’t our infrastructure be the same? 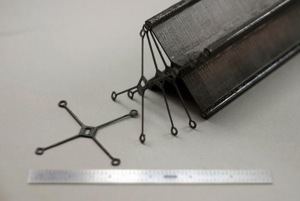 MIT researchers have developed a lightweight structure whose tiny blocks can be snapped together much like the bricks of a child’s construction toy. 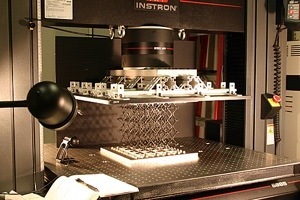 The new material, the researchers say, could revolutionize the assembly of airplanes, spacecraft, and even larger structures, such as dikes and levees. 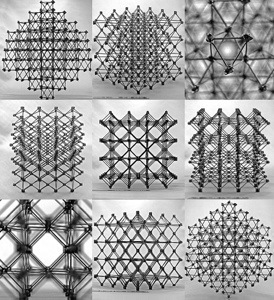 Assemblies of the cellular composite material are seen from different perspectives, showing the repeating “cuboct” lattice structure, made from many identical flat cross-shaped pieces. If you can’t tell that last picture is a load cell, an instrument for applying precisely controlled loads to CRUSH YOUR ENEM…. uh, I mean… test the strength of a part or structure. Obviously the MIT press piece is the base, but the others each have a little different insight. This entry was posted in 3D Printing, engineering, Technology and tagged automation, building, Robotics, scale by Sci Fi Engineer. Bookmark the permalink.